There has never been a change of government in the history of Malaysia. After the hardest contested election so far, the ruling Barisan Nasional coalition will continue to stay in power despite losing the popular vote. Indepedent observers have labeled the election as only "partly free, no fair". 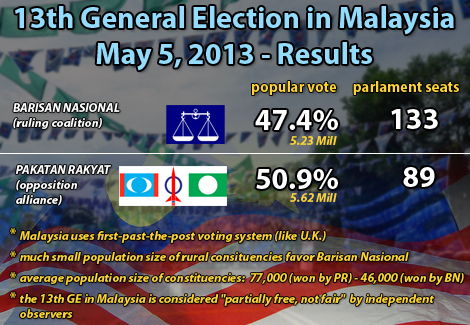 Despite the fact that many irregularities and mass media strongly favors the ruling ruling Barison Nasional coalition, the opposition Pakatan Rakyat manage to win the populate with 50.9%. However, because of the uneven size of consituencies which give much more voting power to rural areas, Barisonal managed to get a comfortable majority of 133 seasts (out of 222) despite losing the popular vote with 47.4%. A record number of 84% of voters turned up at the polling stations. 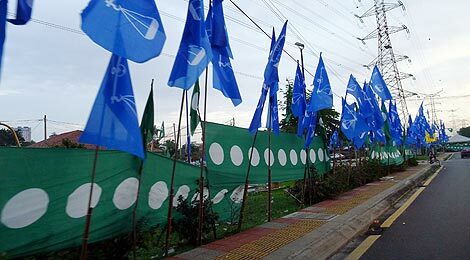 Barisan Nasional (blue colour) and PAS (green colour) flages along the road side in KL. The status quo in Malaysia seem to be that the party with the most flags out on the streets gathers the most votes. Barisan Nasional was formed in 1973 as the successor to the Alliance. Both coalitions have been the federal ruling force since the indepence of Malaysia. Barisan Nasional consists of the Malay UMNO, Chinese MCA and Indian MIC as well as several other parties in Sabah and Sarawak. The vast majority of Barisan Nasional's seats are held by its three largest religion and race-based political parties UMNO, MCA and MIC with UMNO being the clear leader of the coaltion. Pakatan Rakyat was formed in 2008 before the 12th general election creating an alliance between the 3 largest oppostion parties - DAP (Democratic Action Party), PKR (People's Justice Party) and PAS (Pan-Malaysian Islamic Party). The coalition made unexptected gain in the 12th coaltion denying Barisan Nasional a 2/3 majority in parlament and forming the state governments of Kelantan, Kedah, Penang and Selangor.